Every driver has different needs of what should be displayed on car's instruments panel. One drives more in the city and needs navigation the most, the other likes sportier driving and looks more often to rev's and temperature gauges. Not to mention different tastes of visual appearance. So why not allow to choose what to display? 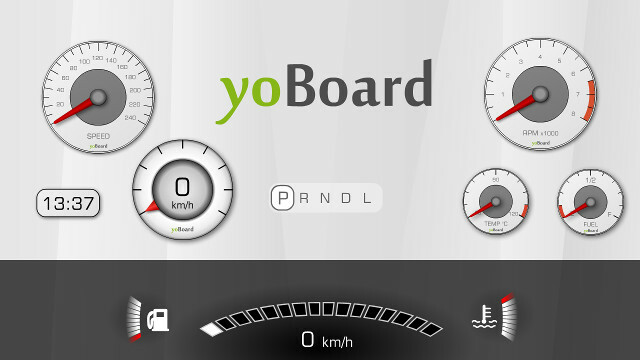 yoBoard solves this problem by providing customizable instruments panel. All customization is done using touchscreen interface – a concept which is already known to most of the people, thanks to smartphones. Driver can select which instruments he wants to have and how they should look like. Created profiles can be saved, this action is straightforward and works the same way as seat memory or radio station memory saving. That's also what most of the people are familiar with. Customization can be extended to other screens, covering wider range of widgets: climate control, media player, etc. Many cars now have touchscreen-enabled center consoles, in that case it's even possible to achieve customizable interface with simple software update.